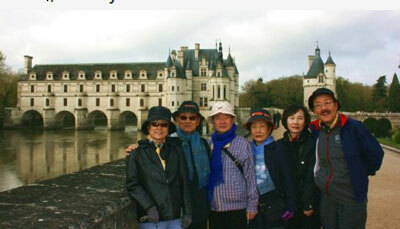 루아르 계곡: 샹보르 성. Loire Valley: Chambord Castle. 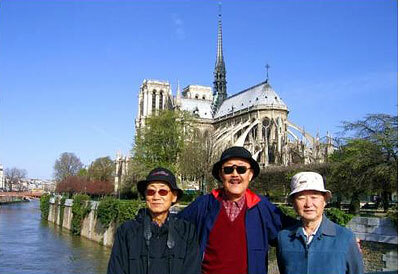 샹보르 성, Chateau de Chambord: 샹보르(Chambord) 성은 16세기 프랑스 루아르(Loire) 강변 계곡에 지어진 초기 르네상스 양식의 성이다. 웅장한 규모와 아름다움으로 프랑스를 대표하는 성으로 손꼽히고 있다. 프랑수아 1세 때 착공되어 루이 14세 때 완공되었다. 중세 초기의 성채처럼 외성곽이 내성을 둘러싸고 있는 구조이다. Chateau de Chambord: The Loire's largest of the Loire chateaux. Brainchild of the extravagant Francois I began as a hunting lodge, which was razed. 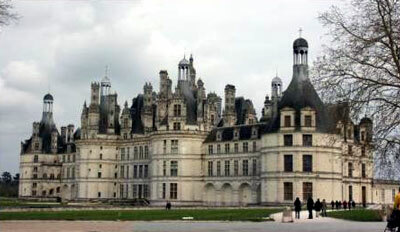 The creation of present-day Chambord began, to a design probably initiated by Leonardo da Vinci. ∧ (좌,left) 테라스와 연결되는 이중 나선형 계단은 레오나르도 다빈치가 고안한 것으로 유명하다. 계단을 오르고 내리는 사람들이 서로 만날 수 없다. Grand staircase: This innovative double-helix staircase ensures that the person going up and the person going down cannot meet. ∧ (우,right) 조개껍질은 여자의 음부와 연관하여 다산성을 연관시킨다. 길조의 상징, 에로틱 한 것, 여성의 상징이기도 하다. ∧ 프랑수아 1세가 레오나르도 다빈치의 임종을 지켜보고 있다. 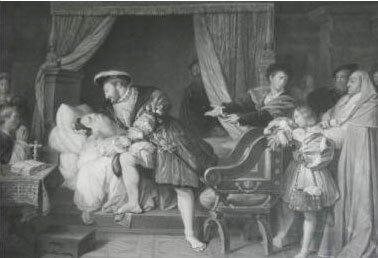 Francois I at Leonardo da Vinci's death-bed. ∧ (上左,upper left) 프랑스와 1세. Francois I. ∧ (上右,upper right) 불 속에서도 살 수 있다고 믿어졌던 전설속의 동물인 샐러맨더는 프랑스와 1세의 문장(紋章)이기도 하다. 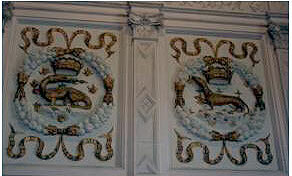 Francois I chose the salamander as his enigmatic emblem. Salamander is the mythical creature once thought capable of living in fire or capable of withstanding heat. 프랑수아 1세(영어로는 Francis I)] (1494-1547): 1515년에 파랑스의 왕위에 오르자, 이태리의 밀란(Milan) 지방을 정복한다. 이태리에 있는 동안 그들의 문예부흥에 영향을 받아, 예술방면에 후원자가 된다. 레오나르도 다빈치도 초청하였고, 다빈치는 샹보르 성 근처에 3년간 살다가 사망한다. 이때 다빈치가 '모나리자'의 그림을 갖고 왔다. Francois I, Francis I in English (1494?1547): When he acceded the throne in 1515, he set out to reconquer the Italian province of Milan, which his predecessor, Louis VII, had lost. Stimulated by his victory and influenced by Italy's Renaissance architecture, he undertook to build this chateau. Francis I, France's first Renaissance monarch, became a major patron of the arts. He lent his support to many of the greatest artists of his time and encouraged them to come to France. Some did work for him, including such greats as Andrea del Sarto, and Leonardo da Vinci, whom Francis convinced to leave Italy in the last part of his life. While Leonardo did little painting in his years in France, he brought with him many of his great works, such as the Mona Lisa, and these stayed in France upon his death. 루아르 지방: 슈농소 성. Loire Valley: Château de Chenonceau. 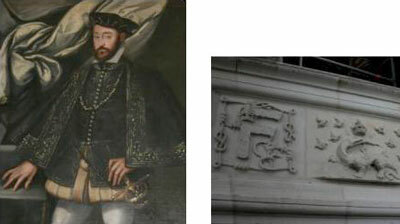 슈농소 성, Chateau de Chenonceau : 루아르 강의 지류인 셰르(Cher) 강 위에 있는 "르네상스"성으로 "6여인의 성"이라고 불린다. 프랑수아 1세 때 재무관이던 토마스 보이르가 1513∼1521년에 축조하였다. 프랑수아 1세가 사망하고 그의 둘째 아들인 앙리 2세(Henri II)가 왕위를 이어받자 그는 이 성을 20살 연상의 애인인 디안 드 프와티(Diane de Poitiers)에게 주었다. 앙리 2세는 사냥을 핑계 삼아 슈농소 성에 빈번하게 들렸고, 왕국의 주요 정치는 디안에 의해 조종되었다. 앙리 2세가 죽자 왕비인 카트린 드 메데시스(Catherine de Midicis)는 디안으로 부터 성채와 왕가의 보석을 빼앗고 허름한 쇼몽 송을 대신 내주었다. 이후 앙리 2세가 사망하자 카트린은 며느리에게 슈농소를 내주었다. 슈농소는 4세기에 걸쳐 6명에 이르는 여성주(女城主)가 살았다. 그래서 '6여인의 성'이라는 별명이 있다. Chateau de Chenonceau : The 16th-century "Renaissance" chateau of Catherine de Medici was built on the site of an old mill on the River Cher. Eventually, the chateau was seized from Bohier's son by Francois I for unpaid debts to the Crown, and after Francois' death in 1547, Henry II offered the chateau as a gift to his mistress, Diane de Poitiers who was 20 years older than the King. After King Henry II died in 1559, his strong-willed widow and regent Catherine de' Medicis had Diane expelled. As Regent of France, Catherine would spend a fortune on the chateau and on spectacular nighttime parties. The grand gallery, which extended along the existing bridge to cross the entire river, was dedicated in 1577. On Catherine's death in 1589 the chateau went to her daughter-in-law, Louise de Lorraine-Vaudemont, wife of King Henri III. And so on. ∧∧ 루아르 강의 지류인 셰르 강에 있는 아름다운 성이다. 성내의 아름답고 널찍한 정원을 본다. 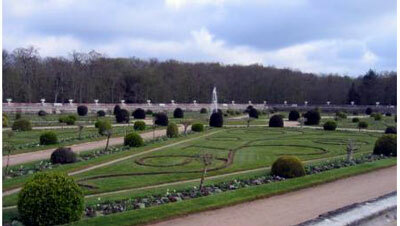 Chateau de Chenonceau & its beautiful garden. ∧ 16세기 부엌을 볼 수 있다. 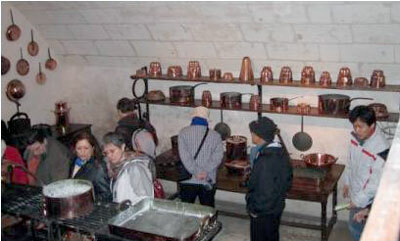 16-century Kitchen. ∧ (좌,left) The Three Graces는 그리스 신화에 나오는 아름다운 3 자매 여신으로 대개는 3자매가 춤을 추는 모양으로 나온다. 이 그림에 나오는 3 자매는 루이 15세에게서 총애를 받던 3 자매로서 3 'Grace'에 비유하여 그린 그림이다. 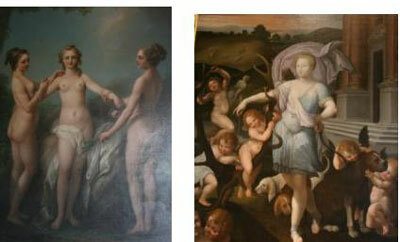 The Three Graces represent 3 sisters, successive favorites of King Louis XV. Three Grace sister goddesses in Greek mythology dispense charm and beauty, and often appear dancing in a circle with her sisters. ∧ (우,right) 이름도 디아나(Diane de Poitiers)이지만 자기자신을 사냥의 여신 디아나에 비유하여 그렸다. Portrait of Diane de Poitiers as Diane the Huntress. ∧ 샐러맨더는 프랑수아 1세의 심볼이며, 불 속에서도 살 수 있다고 믿어졌던 전설상의 동물이다. Salamander: A mythical creature, generally resembling a lizard, once thought capable of living in or withstanding fire. 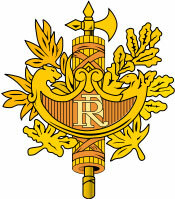 Symbol of Francois I. ∧(좌,left) 캐서린 드 메디치의 초상화. Catherine de Medici. ∧ (우,right) 서로 꼬이는 "C"자는 캐서린 드 메디치를 뜻하고; "H자 위에 왕관이 있는 것"은 그 녀의 남편 앙리 2세를 뜻한다. 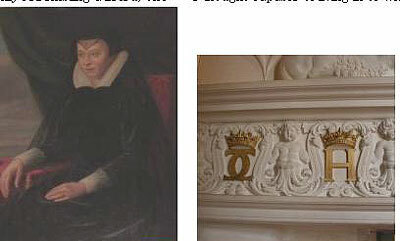 Two intertwining "C"s of Catherine de Medici. "H with Crown" represents her husband, King Henri II. 캐서린 드 메디치(1519-1589) 는 이탈리아의 플로렌스에서 태어나고, 14세에 후에 앙리 II 세(Henry II)가 되는 앙리와 결혼한다. 앙리 II세 왕은 20세 연상의 정부인 Diane de Poitiers에게 더 관심을 보인다. 왕이 사망한 후 그녀는 3왕의 모친으로 젊은 2 왕의 섭정을 했고, St. Bartholomew의 날에 대학살을 감행하기도 했다. Catherine de Medicis (1519-1589): was born in Florence, Italy. At the age of fourteen, she married Henry (later, King Henry II). Throughout Henry II's reign, he excluded Catherine from influence and instead showered favours on his mistress, Diane de Poitiers. Henry's death in 1559 thrust Catherine into the political arena as mother of the frail fifteen-year-old King Francis II & her ten-year-old son King Charles IX. She was ambitious, authoritarian and endowed with diabolical Florentine intelligence. She acted as regent during the first 2 young kings. 보르도는 프랑스에서 5번째로 큰, 아름다운 도시로 '가론' 강이 흐르고 있다. 시내에 유명한 광장과 'grand theatre'가 있고 또한 포도주 산지로 유명하다. 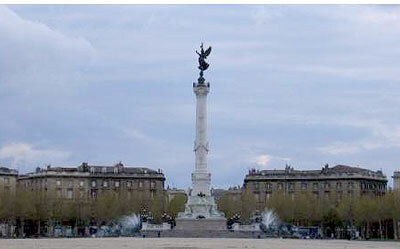 Bordeaux is the 5th largest & beautiful city along the River Garonne. The city is famous for wine and also grand theatre. ∧ 'Grand Theatre'는 고전양식으로 지어져 있고, 12 무사 (muses)로 장식되어 있다. 무사들은 제우스(Zeus)신과 Mnemosyne사이에서 태어난 아홉 자매로 그리스 신화에서 예술 및 과학 분야를 담당하고 있다. 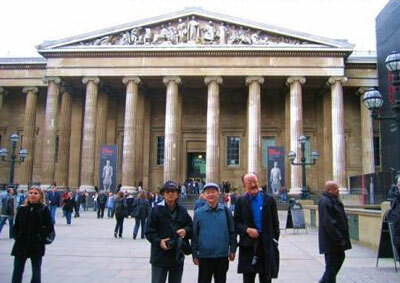 Grand Theatre was built in 1773-80 and is a masterpiece of the Classical style, crowned by 12 statues of the muses. Muses are the 9 daughters of Zeus and Mnemosyne, each of whom presides over a different art and science. 생 떼밀리옹 (St-Emilion) 마을: 8 세기 경에 바위에 굴을 뚤어 은둔했던 에밀리옹 (후에는 St-Emilion)이 살던 곳에 수도원이 들어오고, 마을이 형성되었다. 12세기의 요새가 아직 남아있고 좁은 길을 따라 옛날의 집들이 나열되어 있다. 비싼 포도주의 생산지로도 유명하다. 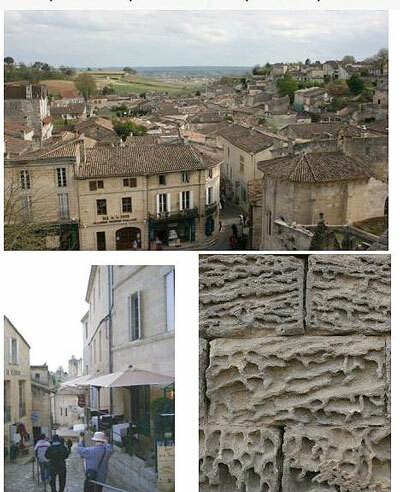 St. Emilion is renowned the world over for its fine wines. An 8th-century hermit, Emilion dug out a cave for himself in the rock. A monastry followed. Medieval houses still line the narrow streets, and parts of the 12th-century ramparts remain. 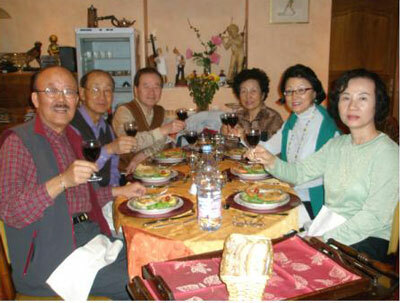 ∧ 생 떼밀리옹 (St-Emilion) 마을은 비싼 포도주의 생산지로 유명하다. ∧ (상, 좌, above & left) 옛날의 집과 좁은 길. Medieval houses & the narrow streets. ∧ (우,right) 성당을 지을 때 쓰던 돌 (석회암)이 시간이 지남에 따라 변한 모양. The wall of the local Cathedral was constructed with 'limestone', which has been eroded as above. 라스코 동굴벽화: 라스코(Lascaux)는 프랑스 남서부에 있는데, 이곳에는 구석기 시대의 벽화로 유명한 동굴이 있다. 원래의 벽화는 시간이 흐름에 따라 악화 일로에 있게 되어, 이들을 똑 같이 복사해놓은 라스코 II 를 보았다. 벽화는 잘 구경하였지만 안내서 및 가이드는 모두 프랑스어니 약간 실망하였다. Lascaux II: is the most famous of the prehistoric (15,000 BC) sites clustered around the junction of the rivers Vezere and Beunein the south-western France. 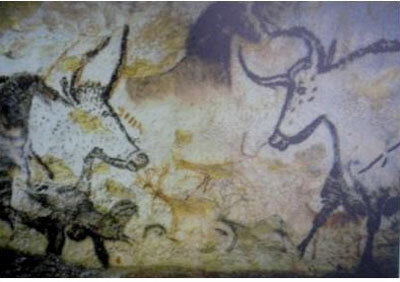 4 boys came across the caves and their astonishing paleolithic paintings in 1940. Lascaux has been closed to the public since 1963 because of deterioration, but an exact copy has been created a few minutes' walk down the hill-side, using the same materials. The replica is beautiful and should not be spurned: high-antlered elk, bison, bulls and plump horses cover the walls, moving in herds or files, surrounded by arrows and geometric symbols thought to have had ritual significance. Disappointed some as only French in guide and literature was used. Paleolithic paintings in Lascaux II (copied from Wikipedia). 아비뇽, 아를. 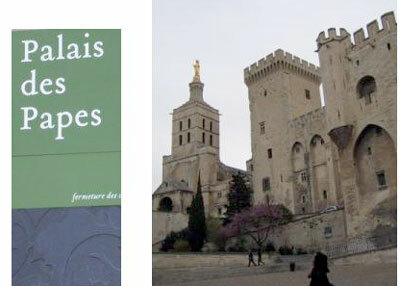 Avignon, and Arles. Avignon, 아비뇽: 론 (Rhone)강가에 있는 아름다운 도시 아비뇽에서는 웅장한 교황청(1309-77)과 유명한 다리를 본다. 13세기 로마에는 강력한 2 가족이 교황 권을 흔들고 있었다. 여기에 불만을 갖인 교황은 프랑스 왕의 배려(? )로 1309년에 교황청을 로마에서 아비뇽으로 옮기었다. 1377년 까지 이곳에 68년 간 있는 동안 이 같이 커다란 호화롭고, 요새와 같은 건물로 변형 되었다. Avignon: Enjoyed this beautiful provincial town, nestling on the banks of the River Rhone. We saw magnificent Papal Palace and the famous bridge (Pont d'Avignon). Confronted with factional strife in Rome and encouraged by the scheming of Philippe IV of France, Pope Clement V moved the papal court to Avignon in 1309. Here it remained until 1377, during which time his successors transformed the modest episcopal building into the present magnificent palace. Its heavy fortification was vital to defend against rogue bands of mercenaries. ∧ 교황청 (1309-77). Papal Palace(1309-77). ∧ 유명한 다리를 본다. 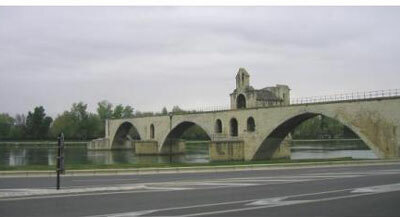 The famous bridge (Pont d'Avignon). Arles, 아를: 론 (Rhone) 강에 면한 도시로 고대 로마의 원형 극장과 고대 극장을 본다. 이곳에서 1888-89 년 살면서, 반 고흐는 "해바라기"등 많은 그림을 그렸다. 옛 도시이기에 길이 매우 좁았다. ∧ 고대 로마의 원형극장. 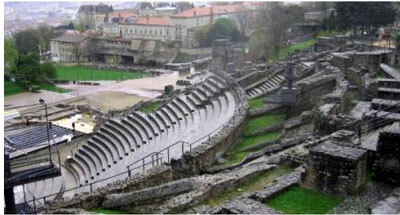 Roman amphitheater. 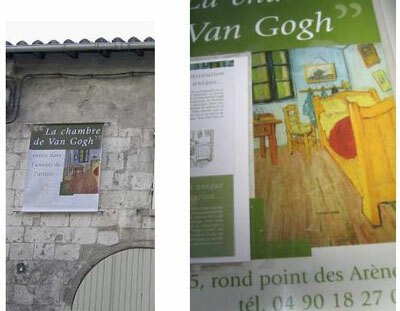 ∧ (좌,left) 빈센트 반 고흐가 살던 집.
Vincent Van Gogh lived here. ∧(우,right) 반 고흐의 그림으로 그가 아를에 살 때 그린 "빈센트의 침실"이다. "Vincent's Bedroom in Arles" 1888. (Original in Van Gogh Museum in Amsterdam). ∧ (좌,left) 빈센트 반 고흐의 "파이프가 놓인 의자". Van Gogh's "Vincent's chair with his pipe", Arles 1888. Arenas. 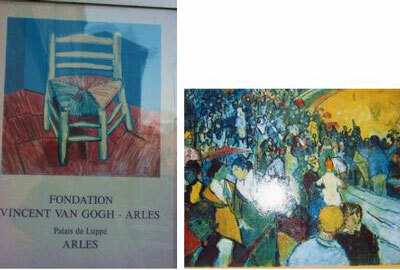 Van Gogh's Arena of Arles. Marseille, 마르세유: 지중해안의 항구도시인 마르세유는 아름답기만 하다. 프랑스에서 가장 큰 항구이고, 도시로는 파리 다음으로 크다. 구(舊) 항구를 구경한 뒤, 배를 타고 저만치 나가서 마르세유 시내를 멀리서 보기도 하고, 신 항구의 유람선도 보고, '몽테 크리스트 백작'이 같여 있던 '이프 섬과 이프 성'을 보기도 했다. 점심은 Le Val d'Isere라는 식당에서 24 euro=$38를 내고 유명한 프랑스 음식의 하나인 부이야베스 (Bouillabaisse)를 먹기도 했다. 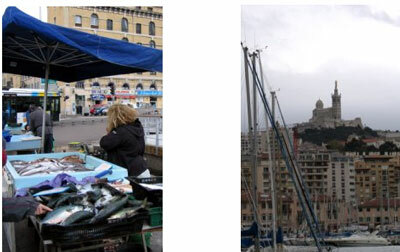 Marseille is the second-largest city and France's largest port on the Mediterranean. Here, we saw the old port (or vieux port), and cruised along the shore. 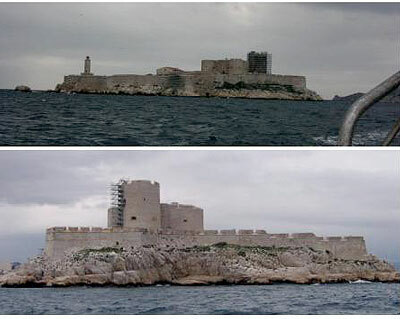 During the cruise, we saw the city, and also Ile d'If (Island of If) and Chateau d'If ( chateau of If) famous in the novel, "The Count of Monte Cristo" . For the lunch we ate 'bouillabaisse', a famous French dish which costed 24 euro=$38 at Le Val d'Isere, a restaurant along the old port. 부이야베스 (Bouillabaisse)는 프랑스의 남부의 항구도시인 마르세유에서 생겨난 생선과 해물요리를 일컷는다. 이 단어는 "끓인다(불어론 bolhir 영어론 boil)와 불을 낮추어(불어론 abaissar, 영어론 to lower (heat)"의 혼합형이다. 그러니 '불을 낮추어 오래 끓인다'라는 뜻이다. 처음에는 바닷가 어부들의 소박하고도 일상적인 요리였지만 지금은 프랑스를 대표하는 생선요리가 되었다. 이 요리에 쓰이는 생선은 대개 전갈, 성대, 붕장어 등이고, 해물로는 새우, 계, 조개 등이 있다. 물론 여기에 채소와 조미료가 가해 있다. Bouillabaisse is a traditional Provencal fish stew originating from the port city of Marseille. The word, 'bouillabaisse' comes from a compound word that consists of the two verbs bolhir (to boil) and abaissar (to lower (heat)). Bouillabaisse is a fish stock containing different kinds of cooked fish and shellfish and vegetables, flavored with a variety of herbs and spices such as garlic, orange peel, basil, bay leaf, fennel and saffron. There are at least three kinds of fish in a traditional bouillabaisse, typically scorpionfish (fr: rascasse); sea robin (fr: grondin); and European conger (fr: congre); and it can also include gilt-head bream (fr: dorade); turbot; monkfish (fr: lotte or baudroie); mullet; or silver hake (fr: merlan) It also usually includes shellfish and other seafood such as sea urchins (fr: oursins), mussels (fr: moules); small crabs (fr: etrilles); spider crab (fr: araignees de mer) or octopus. More expensive versions may add langoustine (from Wikipedia). ∧ 선상에서 보이는 마르세이유. Marseille. ∧ 마르세유: 구항구. Marseille: old port or vieux port. ∧ 구 항구에서는 많은 요트를 본다. 우리가 탄 유람선도 여기서 출발하였다. Many yachts in the old port or vieux port. We started our cruise from this 'old port'. ∧ (좌,left) 아구 등을 파는 생선장수들. They sell all kinds of fish at old port. ∧ (우,right)노트르담 드 라 가르드 (Notre-Dame-de-la-Garde) 사원이 언덕에 있다. Notre-Dame-de-la-Garde on top of the hill. 몬테크리스토(Monte Cristo) 백작. The Count of Monte Cristo. 이 이야기는 억울한 누명을 쓰고 14년 동안이나 꽃다운 청년기를 죽음의 감옥에서 보낸 주인공 에드몽 당테스가, 필사적인 탈옥 후에 몽테크리스토 백작이 되어 원수를 갚는 과정을 그린 소설이다. 1815년 항해사 '에드몽 당테스(Edmund Dantes)'는 선장으로 승진하고, 또한 아름다운 여인(Mercedes)과 약혼을 하게 된다. 이에 시샘한 동료들이 그를 고소하게 된다. 당테스는 억울한 누명을 쓰고 섬(이프 섬)에 위치한 감옥 (이프 城, Chateau d'If)에 감금당하게 되고, 이곳에서 14년 동안이나 꽃다운 청년기를 죽음의 감옥에서 지내게 된다. 감옥에 있는 동안 그는 늙은 승려를 만난다. 승려가 죽기 전 당테스에게 보물섬의 지도를 준다. 결국 그는 감옥을 필사적으로 탈출하고, 고생 끝에 보물들을 찾아낸다. 보물섬의 보물을 이용해 부자가 되어 자신의 고향으로 돌아온 그는 몬테크리스토(Monte Cristo) 백작이 된다. 마을의 이곳저곳을 돌아다니며 용의자를 찾아내 잔인한 방법으로 복수를 하는 것이 이야기의 줄거리다. ∧∧ 이프 섬에 있는 이프 城. Chateau d'If on Island of If. 리옹, Lyon : 프랑스에서 3번째로 큰 도시로 상업, 미식(美食), 영화로 유명하다. 이 도시를 상징하는 기(旗)에는 영어의 발음과 같은 'lion', 사자가 그려있다. 1) BC 44년에 시저(Caesar)가 세운 루그두눔이라는 로만의 도시는 상업의 중심지 및 군사 주둔지였다. 로마 시대의 극장을 보았다. 2) 리옹 구시가지에서는 르네상스 시대의 건축물들을 본다. 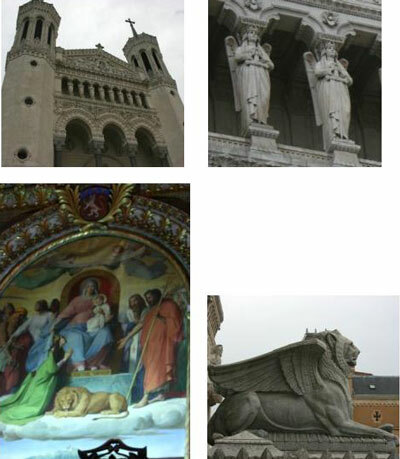 3)푸르비에르 노트르담 대성당(Basilique Notre-Dame de Fourviere): 비잔틴 양식으로 지은 대성당으로 이곳에서 리옹의 시가지를 잘 볼 수 있다. 성당 안에서는 모자이크 장식들을 본다. 성모 마리아가 보호. 프루시아 전쟁 중 건축하였다. 4)미술박물관(Musee des Beaux Arts)은 프랑스에서는 루브르 다음으로 중요한 박물관이기도 하다. Lyon: It is the third largest French city, and is a major centre of business, and has a reputation as the French capital of gastronomy. City flag shows lion and lilies. They have annual celebration of thanks to the Virgin Mary, who purportedly saved the city from a deadly plague in the Middle Ages. 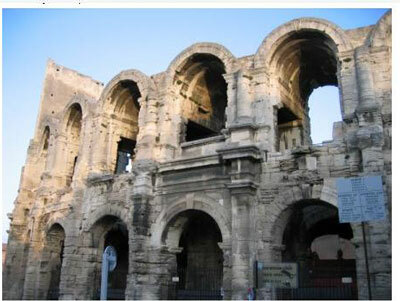 1) Lyon is the site of the Roman city of Lugdunum, the commercial and military capital of Gaul founded by Julius Caesar in 44 BC. We saw Roman amphitheatre on the hillside. 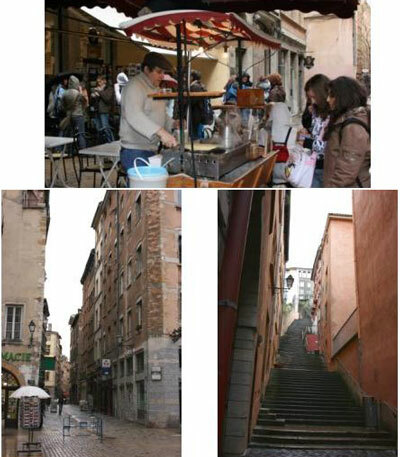 2)The restored old quarter of old Lyon, Vieux Lyon, was the MedievalQuarter of town. Here, we saw many buildings from the Renaissance. 4)The Basilica Notre-Dame de Fourviere, built in the 19th century in mock-Byzanthine style, features fine mosaics, superb stained glass, and a crypt of Saint-Joseph. 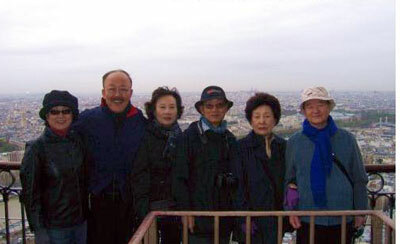 Perched atop the Fourviere hill, the basilica commands a spectacular view of Lyon and its suburbs. In 1870, the people of Lyon and their archbishop sought once again the Virgin's intercession so that the Prussian armies could not enter the city. This prayer was answered, and as a sign of gratitude the decision was taken to build up the basilica. 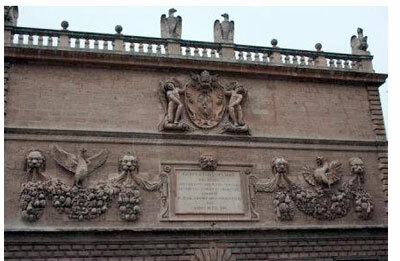 Symbols for Mary, guardian of the city, the basilica appears massive. 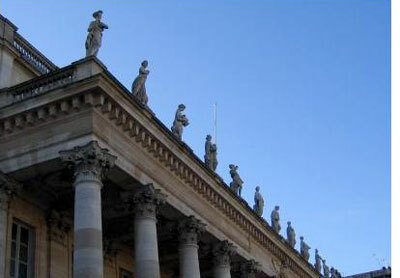 5)Museum of Fine Arts(Musee des Beaux Arts) has most important collection of art after the Louvre. ∧ 푸르비에르 언덕에 있는 로마 시대의 극장(Theatres Romains). 매년 6월에는 음악·연극, 등의 축제가 지금도 열린다고 한다. Roman amphitheatre on the hillside. Festivals are still held here. ∧∧∧ 리옹 구시가지에 있는 르네상스 시대의 건축물, 자갈로 포장된 도로, 많은 상점, 음식점 등을 본다. The restored old quarter of Vieux Lyon. The Medieval Quarter of town, with cobbled streets, shops, and dining. 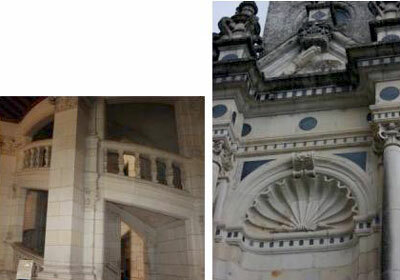 ∧(상좌,upper left) 푸르비에르 노트르담 대성당, Basilique Notre-Dame de Fourviere. ∧(상우,upper right) 천사가 caryatid가 됬나? Angels as caryatids? ∧ (하좌,lower left)성모 마리아와 사자다. 이들이 리옹을 보호한다. Maria & Lion, who protect Lyon. ∧(하우,lower right) 성당 앞에 있는 "날개달린 사자". Winged Lion in front of the basilica. ∧ 미술박물관. Museum of Fine Arts(Musee des Beaux Arts, Lyon). 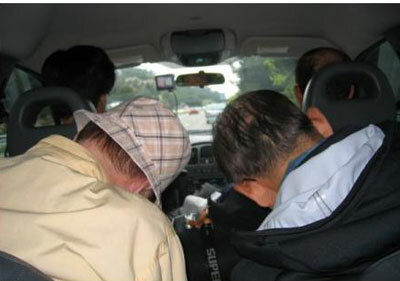 2008년 3월 27일에서 4월 10일까지 약 2주간 오 원환 부부, 심 영보 부부, 그리고 손 기용 부부가 프랑스를 여행하고 돌아왔다. 파리에 1 주일 그리고 남어지 1주간은 파리 밖의 다른 도시들을 구경했다.파리에 있는 동안에 하루는 런던의 대영박물관을 보기도 했다. 많이 보고, 듣고, 배우고, 그리고 정말로 즐거운 시간을 갖고 집에 돌아 왔다. 1)호텔 중에 하루는 프랑스 인이 경영하는 데서 민박을 했는데, 시설도 그리고 주인도 좋았고, 음식도 좋았기에 추천하고픈 마음도 든다. 2)음식 중에는 프랑스 빵, 'crepes'라는 얇은 팬케이크, '달팽이', 닭고기 요리, 그리고 생선요리의 하나인 '부이야베스, bouillabaisse'등이 좋았다. 3)우리가 본 박물관 중에는 파리에 있는 오르세 박물관, 루브르박물관, 현대박물관, 그리고 리옹에 있는 현대 미술박물관 그리고 런던의 대영박물관을 즐겼다. 4) 우리 3쌍과 가이드로 된 적은 숫자의 그룹이기에 모든 것이 편이했다. 자세히(?) 보며 역사적인 것 그리고 신화적인 것도 생각해 보았다. 5)파리의 노트르담 대성당, 몽마르트 언덕, 개선문,콩코르드 광장, 샹젤리제 거리, 뛸르리 정원, 에펠탑, 퐁 네프 다리와 연관 된 이야기, 등 볼 것도 많다. 6) 파리 밖의 몽셸미셀, 슈농소 성, 마르세유, 리옹, 아를르 등지를 다녀 온 것이 모두가 다 좋았다. 기대를 너무 했기에 약간 실망했던 곳은 라스코의 동굴과 아비뇽이었다. 무어니 무어니 해도 친구들과 여행하던 것이 제일 기억에 남으리라. ∧ 파리의 노트르담 대성당 후면에서. ∧ 런던의 대영박물관 앞에서. ∧ 파리를 등에 안고. 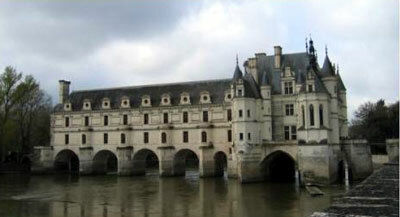 ∧ 슈농소 성, Chateau de Chenonceau 에서. ∧ 리옹 (Lyon)의 식당에서 생일잔치를 축하하며. ∧ 늙은이 들이 긴 여행을 하자니 차에서 조는 일도 드물지 않았다.